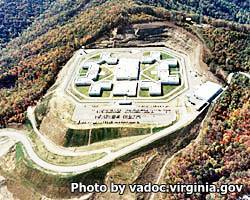 Wallens Ridge State Prison is a supermax penitentiary located in Big Stone Gap Virginia. It houses about 1,200 male inmates, most with long sentences that include life and multiple life terms. In the past decade this prison has become a focal point for human rights watch groups that claim the practice of housing inmates at Wallens Ridge from far away states creates a danger to the inmate, and restricts them from seeing family and community members. This prison was the focus of a 2006 documentary called "Up the Ridge" which highlights many of the issues. In 2014 a corrections officer from Wallens Ridge State Prison was arrested for selling drugs to an undercover officer. This facility does not currently house any special population of offender or participate in the Virginia Correctional Enterprise program, however things are changing, and the facility is expected to host an enterprise program soon, employing inmates in the operation. Additionally, this facility is creating new programs and upgrading many aspects which should be completed in the near future. Anyone who want to visit an offender at Wallens Ridge State Prison must first have an approved visitors application on file. Visiting is held on Saturdays and Sundays, the time and day an offender is allowed visits rotates regularly, contact the facility for more details.